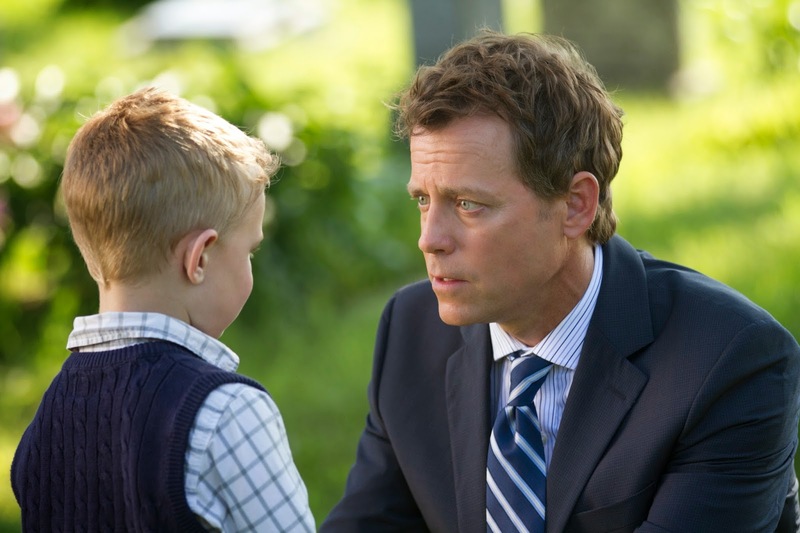 Adapted from the best-selling book based on a true story, Heaven is for Real should just be called "Greg Kinnear is For Real." There was one point in the film where Kinnear was having "none of it" and those moments were the best in the whole movie. As soon as the credits rolled, I raced home. Dallas cops were simply no match for my Kia Optima. I tore up my house in a frenzy, knowing that I owned this book. Keep in mind that I have not read it, but I somehow acquired it. I have no idea how, but it just sort of lived on my kitchen cabinet for almost a year. Along with all of my Jack in the Box receipts. After discovering the book's location, I casually skimmed through the pages. Written by Todd Burpo, whom Kinnear plays in the film, and Lynn Vincent, I didn't see much of a ground breaking difference in the writing from the book to the film. Chris Parker and Randall Wallace were the men responsible for the screenplay. Not to say that I was disappointed with the writing, because it was based off of the book, but I simply wanted more. The screenwriters can only do so much with what they are given in the first place. But I just wanted it to go in a different direction, but it cannot do that since it is based off of someone's life. The cast was the film's strongest suit. So as an audience member, I really wanted to see the writers use them to each of their full potential. There were countless scenes that did absolutely nothing to the plot of the Burpo family story. Greg Kinnear is a marvelous actor, and his best scene was when his character struggled with his religion and questioning his very own beliefs. I would have loved to see the family fall apart with the near death of their son. Not that the film didn't achieve some of those scenes, I just needed more. I'm a sap for sadness. The movie was far too dictated in scenes that didn't belong and were only in there for the purpose of a couple of laughs. With a cast like this, a film should not resort to pointless scenes with pointless laughs. The cast will find a natural comedy in the writing like they were always taught to do. Let me be clear, YOU HAVE MARGO MARTINDALE IN YOUR FILM. USE HER! She is a phenomenal actress, and she did not get a line until half way through the film. To be even more clear, I think Margo could have played every part in the movie, and I would have loved it along with the rest of America. I would say the cheesiest part of the film was Colton Burpo's re-enactments of what he believed he saw in Heaven. Not because the idea of him seeing anything is ridiculous, just the fact that the scenes looked far too outlandish in the film. All I wanted was the conviction of a little boy in what he believes to be real and a family coping with the affects. This film did not need any special effects to convey what the boy saw, it just needs the audience to believe him. To do so, it needs great writing. The cast and director will do the rest. Overall, Heaven is for Real has a great group of actors, and I would just see it for them. This is a good family movie, despite a few adult themes. I'm sure kids will identify with Colton Burpo, and it's not bad for them to start coming up with their own conclusions. All in all, go see this as a Sunday matinée with your grandma for $5. Hey, she misses you, and you could get some expensive candy out of the deal. It's a win win scenario. P.s. If you genuinely like the movie, check out the book! You will be happy all around!